Scientists flock to the Aleutians every summer to study the islands’ rich wildlife, long history and active volcanoes. University of Kansas archeologist Dixie West with Herbert and Cleveland volcanoes in the background. Photo courtesy Kristen Nicolaysen. 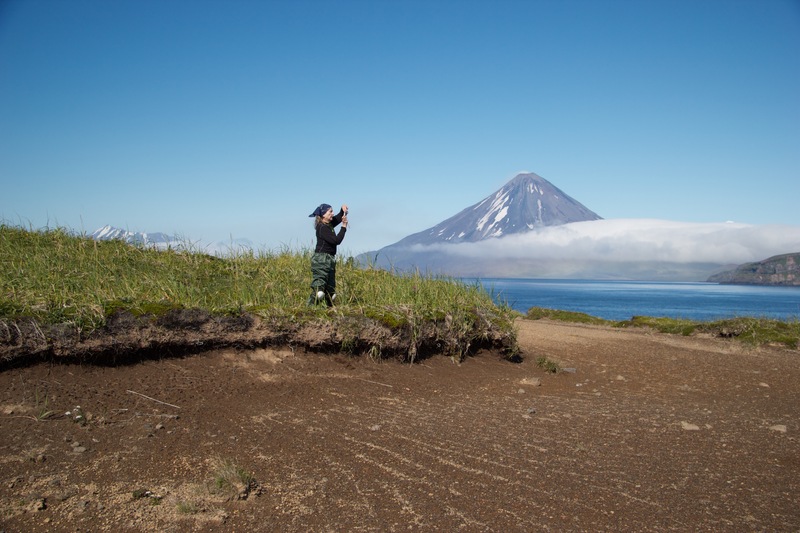 For the past two summers, an interdisciplinary team has visited the Islands of the Four Mountains, in the central Aleutians, to study how resilient the earliest settlers had to be to live there thousands of years ago. Among many finds this summer, archeologists dug up two slate ulus (crescent-shaped knives) on one of their digs on Chuginadak Island. They think the find means these ancient seafaring people were somehow trading or acquiring goods from as far as Kodiak, 700 miles away. There are no known sources of slate in the Aleutians. With their steep shorelines, limited freshwater and rumbling volcanoes, the Islands of the Four Mountains can seem a harsh place for human habitation. But what seems harsh to modern humans—like cliff-lined shores where landing a boat would be difficult—could have provided an advantage in the distant past. The earliest Unangan (or Aleut) people had to be resilient to survive volcanoes, tsunamis, fierce storms and a changing climate. Researchers are attempting to piece together how quickly people returned to villages once they were buried in volcanic ash. Qawalangin Tribe of Unalaska president Tom Robinson said his ancestors picked their village sites carefully, facing away from the open Pacific Ocean, to avoid at least one kind of threat. “If you notice, all of our village sites are predominantly on the Bering Sea side and therefore were protected from tsunamis,” he said. Archeologists this summer also turned up likely evidence of one of the pivotal moments in Aleutian history: the Aleut revolt in the Fox Islands and the Islands of the Four Mountains and Russian fur traders’ brutal response. The Islands of the Four Mountains are uninhabited today, but they had been home to early Unangan people for at least 7,000 to 9,000 years. They remain sacred to people throughout the Aleutian chain. “It’s a regional spiritual area that we hold dear to our heart,” Robinson said. He said he had not heard about the researchers digging into his people’s past until asked about it for this story. “If I was to dig up their ancestors, they’d probably have a problem with it,” he said. 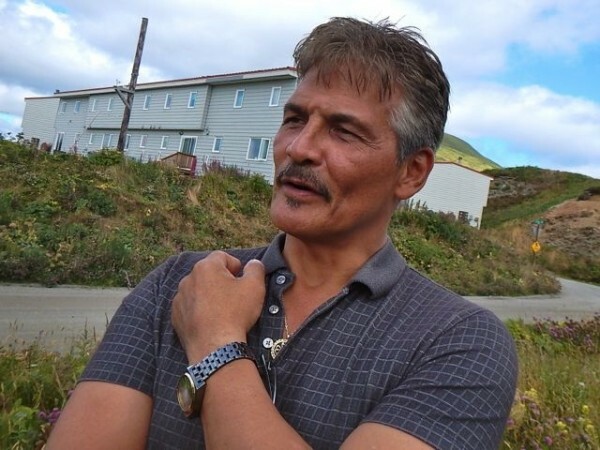 Virginia Hatfield with the University of Kansas said researchers got written permission from the landowner, the Aleut Corporation, and met with Ounalashka Corporation officials in Unalaska. She said they tried to contact the Qawalangin Tribe as well as people in Nikolski, the closest surviving village to the archeological sites, but received no response. Researchers also gave presentations at the Museum of the Aleutians in Unalaska before they started their work last year. Doing archeology or geology is tough in the Islands of the Four Mountains—and not just because of the remoteness or the weather or the risk of a volcano exploding. You can’t use radio-carbon dating to pinpoint when something happened in the past if there’s no carbon-containing material around. 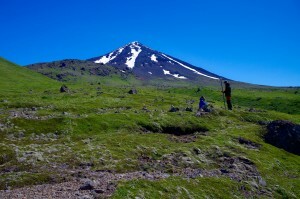 “In the Aleutians, there are no trees, no shrubs in that area, so it’s very difficult for us to figure out when a particular volcanic eruption happened or when a particular tsunami happened,” geologist Kirsten Nicolaysen with Whitman College in Walla Walla, Washington, said. Nicolaysen said archeologists and geologists working together can answer those questions. They can find where ash covers an ancient village’s garbage pile—filled with organic material—and piece together enough carbon to date an eruption. The scientists have had to be a little resilient themselves. Cleveland Volcano on Chuginadak Island exploded while they were approaching it by boat. The big volcano kept rumbling while they were working in its shadow. “At night, when we were sleeping in our tents, we could hear that volcano moaning and groaning,” Dixie West said. She said it was unnerving, but there were no problems. “We’d been around volcanoes enough doing the research that we do to know when we should run or when we should hunker down,” West said. Once they were camped on the island, a big earthquake struck. “We’d just finished dinner, and suddenly this earthquake starts happening. It was incredibly exciting,” geologist Nicolaysen said. She said they very quickly turned their attention to the steam plume rising from Mt. Cleveland. “It was crucial for us to know, was that earthquake affecting the volcano or related to the volcano because if so, we needed to respond to that very quickly,” Nicolaysen said. Quick communication by satellite phone with the Alaska Volcano Observatory revealed that no evacuation was needed: The quake was driven by plate tectonics, not by the volcano they were having dinner on. Nor did it cause any ocean tsunamis. Aftershocks kept giving them some trouble. Nicolaysen said the researchers couldn’t even feel some of them directly, but they’d get dizzy. Last year, members of the same research team helped AVO put the first seismic monitoring instruments on Cleveland Volcano. Now the region can have better warnings when that volcano explodes, as it did this summer. Still, very little is known about the volcanoes of the Aleutians. Mt Carlisle, Mt. Tana and Mt. Herbert—the other three main volcanoes of the Islands of the Four Mountains—had never been studied before the summer of 2014, when the interdisciplinary research team arrived there, according to Nicolaysen. “This is completely undiscovered territory and very exciting science to do,” she said. This summer, AVO scientists put a dozen new sensors on Cleveland Volcano and the first instruments ever on Herbert and Carlisle. The Qawalangin Tribe continues to aim for resilience in the face of environmental threats of uncertain severity. In September, the tribe advertised to hire a climate change planning coordinator. The goal: to help the tribe adapt to a climate that is changing much more rapidly than it did in prehistoric times.